The Lincolnshire and Nottinghamshire Air Ambulance has celebrated its 10th anniversary in style. An open air classical concert was held in the grounds of Hodsock Priory in Nottinghamshire on Saturday night. The concert was not just a celebration but also an opportunity to raise much needed funds. 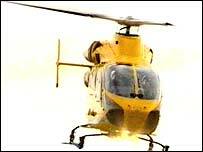 The air ambulance relies on public donations and costs around £1m a year to run. It can get casualties to hospital in under 10 minutes. Peter Aldrich from the air ambulance said: "Without the continuing support of the people of the counties we just could not survive. "Therefore it is vitally important they continue to give their support and happily they show no signs of that support fading." It is hoped the concert could become an annual fundraising event.